The companies that make looms also make and sell warp sticks to fit the looms. These warp sticks are made of wood and sold by the dozen. Warp sticks of the size I need for my 15″ Cricket Rigid Heddle Loom cost $15 – $20 per dozen. One dozen warp sticks will handle 2 – 3 yards of warp, assuming you place the recommended 2 sticks per turn of the beam. Some people recommend placing a complete round of sticks for the first turn, and that might take 8 sticks right there. For the scarves I’ve been making, I had 100″ warps, which means I would need somewhere in the neighborhood of 12 – 20 warp sticks. $15 – $20 for a dozen narrow strips of wood seemed outrageously expensive to me, especially considering that Chris builds things with wood and has a garage workshop full of tools and wood scraps. I went poking around on the interwebs to see if people were making their own warp sticks and, of course, many people are. One interesting option was cutting inexpensive vinyl blinds to the right size. You get dozens of warp sticks for a fraction of the price the loom companies charge. When I attended the Weaver’s Guild of Orlando, I saw a loom using the blinds as warp sticks and talked to the weaver. She liked the method a lot. I decided I would try it! Last Friday, Chris and I went to Home Depot in search of vinyl blinds. I decided to get 30″ wide blinds, which we could cut in half. 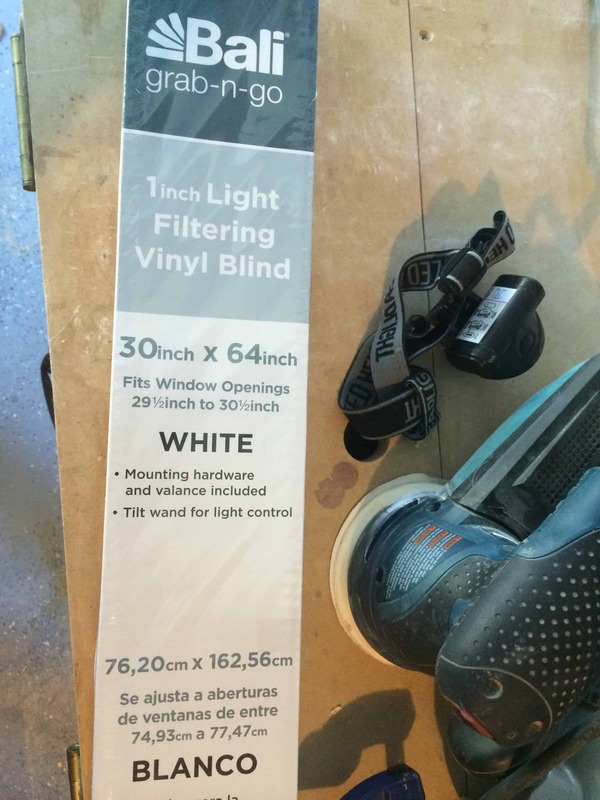 Home Depot had two different options for vinyl blinds, one labelled “Grab-n-Go” was 1/4 of the price of the other option. 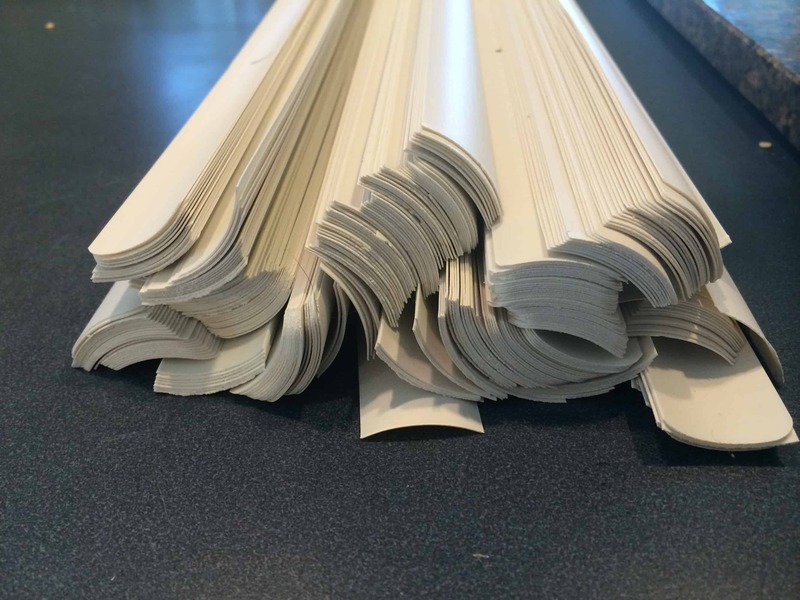 We picked up two packages of the Grab-n-Go blinds 30″ wide by 64″ long for only $5.27 each. Home Depot would not cut the blinds in half for us. That’s part of the “Grab-n-Go” idea, apparently. If we wanted Home Depot to cut them, we would have had to buy the more expensive version ($20 for a 30″ x 72″ blind). 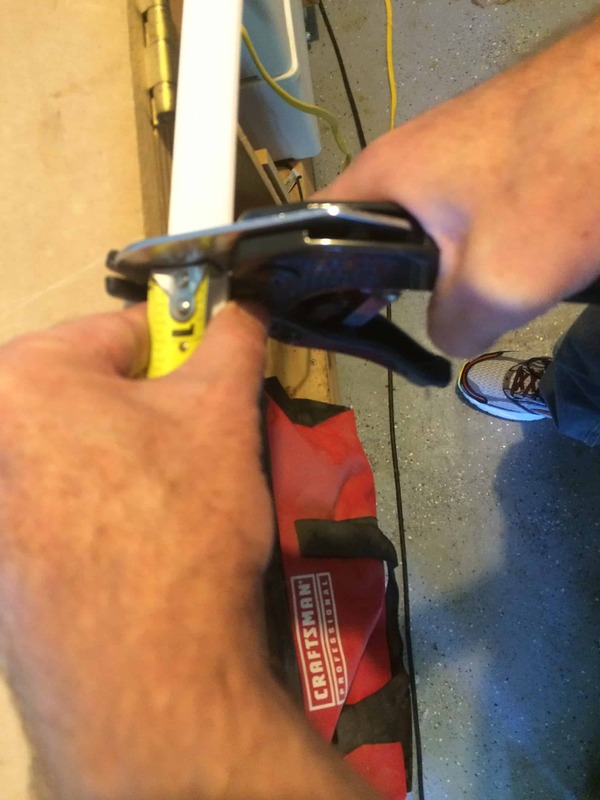 Since Chris has a garage full of tools, cutting them in half ourselves was no big deal. 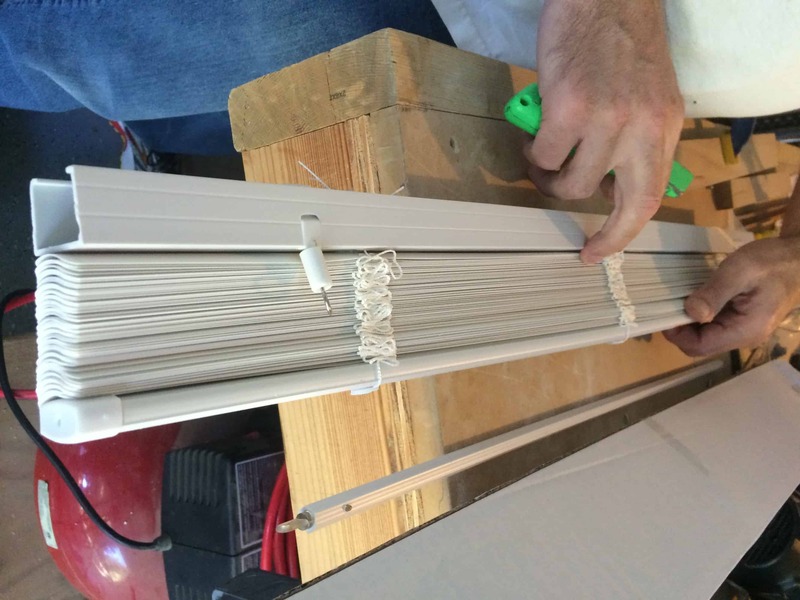 First, we cut the strings and liberated the individual slats from the blind. Then Chris measured to find the middle of the slats. Chris originally planned to cut the slats with one of his saws, but he tried the pipe cutter first and it worked beautifully. We have the pipe cutter to cut the PVC pipes we use for our hydroponics system. I’m not sure how much this tool costs if you don’t already have one, but they aren’t too expensive. 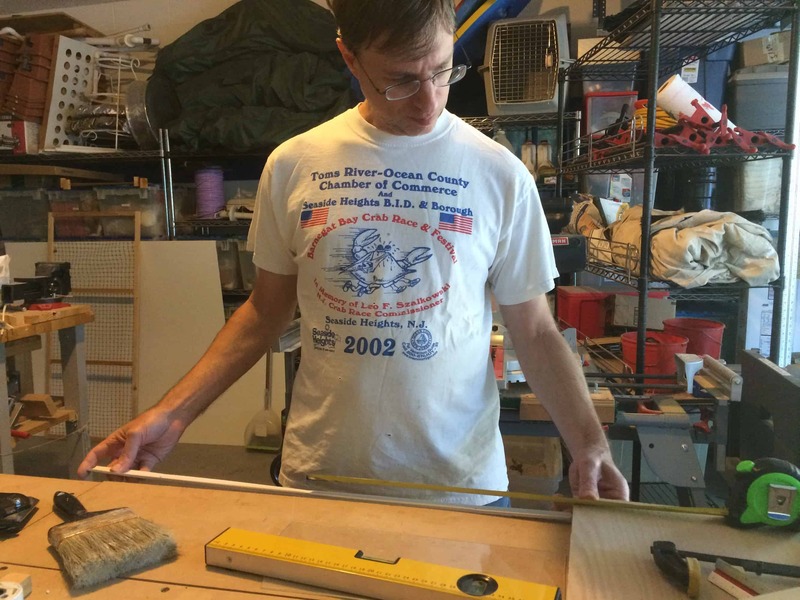 I held one end flush against a board to help stabilize them, and Chris cut through them. We cut 8 – 10 slats at a time. Since the slats were 1″ wide and the blind was 64″ long, I expected each blind to have 64 slats. They ended up having a few extra, 72 total. $10.50 and 20 minutes worth of work yielded 288 warp sticks (24 dozen)!! I haven’t had a chance to use them yet. I don’t expect to tie on another warp until next week. Once I use them, I will write up another post demonstrating how to use them and discussing how I feel about this method. I’ll also decide how many warp sticks I’m going to keep. Since I have far more than I am likely to need, I will probably not keep them all. I’m thinking I’ll bring the extras to the yarn store where I took the class and sell them for $1 / dozen or something like that. Nice. I’ve read about people doing this but I lazily went for paper bags one day at the grocery store (my loom is only 15″ wide, hahaha). Looking forward to reading your review!